Metrix Create:Space is about building, learning and discovery. What have we discovered? People love Workshops. 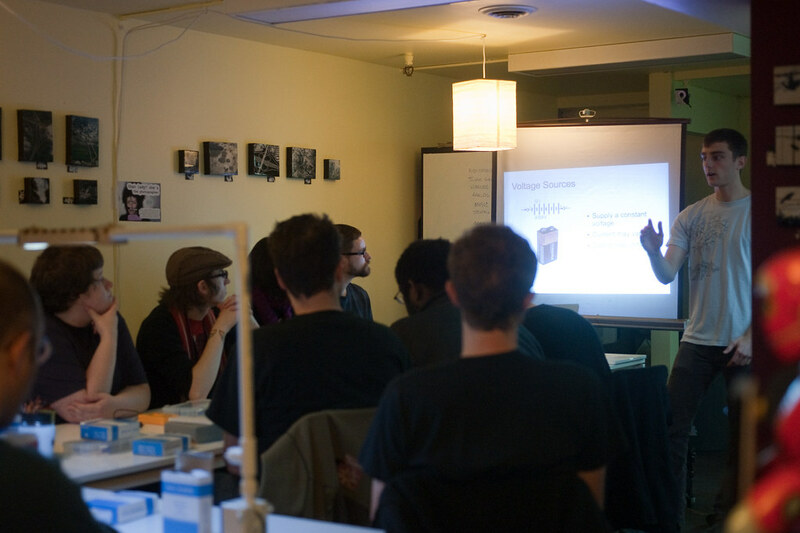 The Introduction to Electronics workshop this Sunday filled up last week, and even before we finished writing this blog post, we got a signup for January. We know you have a thirst for knowledge, and flashing LEDs are just the beginning, so we’ve added Using Transistors to our lineup. A quick google search shows that an Intel Pentium D has 230 million transistors, but do you even know what that means? Come to Using Transistors and find out just what all the fuss is about. We wont come close to building a CPU, but we’ll show you how to build switches, logic gates, and even a simple amplifier circuit. For those of you that want something a bit more permanent than breadboard buildouts, we’ve got soldering and advanced soldering in the pipeline, but are still scheduling times. Watch the blog and twitter for updates. Required Equipment: Everything we gave you in the Intro to Electronics class. (You can buy this stuff here if you don’t have it already).